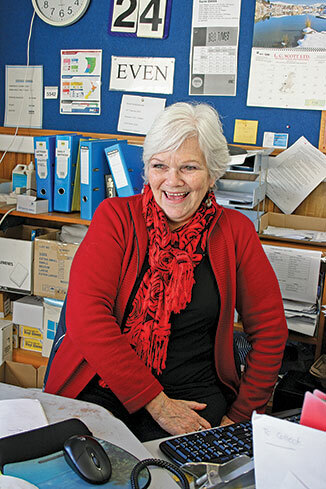 From office electric typewriters to computers, Nicola Adlam, has worked with them all in her near 30 years in the administration office of Otaki College. She retires at the end of term two. Nicky, as she’s known by everyone, has manned the office under four principals, through changes in technology, several uniform changes and numerous staff “passing through” some staying a short time, others for years. As a qualified first aider, Nicky has taken care of the sick and injured during this time. Nicky started work at the College that September, when Rex Kerr was principal and the late John Northern deputy principal. Diane Thomsen was the senior mistress and the principal’s secretary was Colleen Pender. There were 600 pupils from Form 1 to 7. The first computers arrived in the early 1990’s. That was a sharp learning curve, she said, but the changeover was relatively painless. Nicky grew up Waikanae after arriving in New Zealand at two and a half years with her parents and sister. They settled in Wellington for a time before moving to Waikanae where her father built a butcher’s shop and they lived there. She attended Waikanae School and Kapiti College. Retirement after her long life at Otaki College means a shift to Maketu in the Bay of Plenty, with husband Les and her mum. Both their adult sons are in Palmerston North and there are three grandchildren, who’ll be able to stay with the grandparents as they get older. With the move will come more time for gardening, walking and keeping fit with some fishing and possibly playing some badminton, something she has a keen interest in. She will miss out on the new college administration block and library, a small price to pay after all those years, but she has enjoyed the almost 30 years she has been there. Nicky leaves with great memories of her career there and she says she will miss everyone, but wishes the teachers, staff and students great years ahead. There was a farewell student assembly held on Monday and a staff farewell on Friday afternoon, the final day of term two.